Kit Harington plays lead character Jon Snow in the hit fantasy show, on a quest to restore order to the Seven Kingdoms. Lena Headly, Emilia Clarke, Sean Bean and Charles Dance are a few of the seasoned actors who star in Game of Thrones. Fans have to wait until 2019 for the next instalment of the epic show, which will also be the last of Westeros we will see. Game of Thrones is infamous for its ability to kill even the most favourite of our characters, so there is no doubt that the next season will inflict all manner of heartbreak on viewers. Whilst anticipation mounts for the return of Game of Thrones, two of the series’ characters have wed in real life. 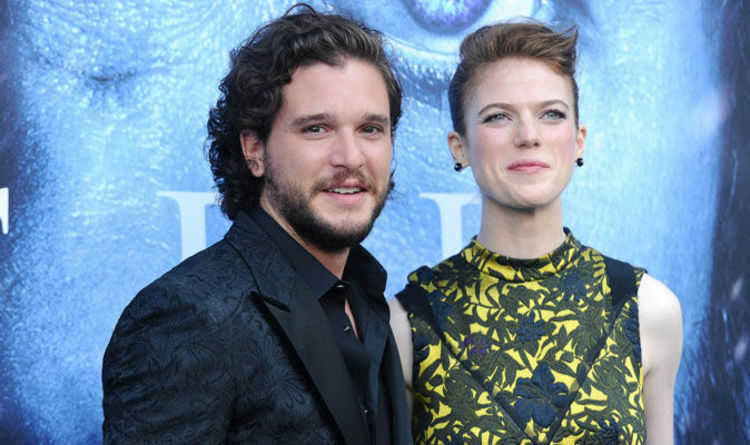 Having met in 2012, Kit Harington and Rose Leslie played lovers Jon Snow and Ygritte, torn apart by Ygritte’s untimely death. However, her departure from the show didn’t prevent Harington and Leslie pursuing a romantic relationship outside of the set. Announcing their engagement in the Times in 2017, the pair wed today in Scotland at Wardhill Castle. Raised in Aberdeen, the 31-year-old was born into a noble family having lived in the stately Lickleyhead Castle. Her father Sebastian Arbuthnot-Leslie is the Aberdeenshire Chieftain of Clan Leslie. Leslie relocated to London, to study at the world-renowned London Academy of Music and Dramatic Art (LAMDA), graduating in 2008. The Scot appeared on Game of Thrones for three seasons, before dying in Harington’s arms succumbing to an arrow injury. Currently, Leslie is the central character in The Good Wife spin-off The Good Fight, in which she plays lawyer Maia Rindell. Her film career has seen her stand opposite Vin Diesel in action/fantasy film The Last Witch Hunter in 2015. She has also starred in high profile TV shows such as Luther alongside Idris Elba, and Vera with co-star Brenda Blethyn. In an ode to her heritage, Leslie is marrying her co-star in her family’s 12th century Wardhill Castle today. Leslie’s older brother William resides at the castle, which is also regularly rented out as a wedding venue. Wardhill Castle is in Aberdeenshire, Scotland, and Game of Thrones cast members have been seen touching down in Aberdeen. Peter Dinklage who plays Tyrion Lannister in the hit show, and Sophie Turner who stars as Sansa Stark were seen arriving at Aberdeen Airport yesterday in anticipation for today’s nuptials.